My Space Shuttle launch story. 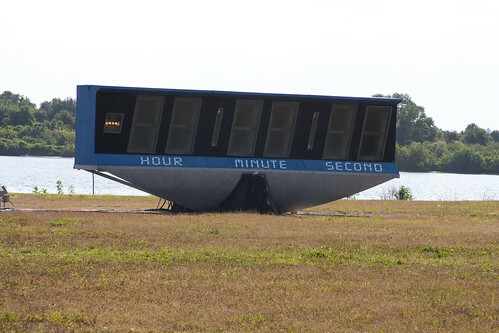 I’ve already posted about how I got to go to the launch through @nasatweetup. 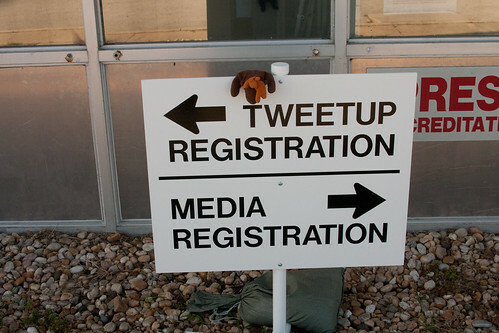 Now I’ve finally got time to tell you about the Tweetup itself! To minimize time taken off work, since I don’t get paid time off, I ended up going right from work to the airport on Wednesday, and then on Monday going right from the airport back to work. So, Wednesday night Rick picked me up at work and we headed to uptown to pick up Melissa (@melissagerman), another woman from Minneapolis who was also selected for the Tweetup. Actually, out of only 150 people, 4 of us were girls from Minneapolis! Anyway, I had been tweeting with the other girls and it turned out that Melissa and I were taking the same flight down. She didn’t have a way to the airport yet so I said we’d be able to pick her up. Luckily she turned out to be really nice and we got along well. The flight down was on Delta, formerly Northworst. Ugh. New name, no improvement. The lack of legroom on their flights can get to be downright painful for my 5’10” self! I’m actually typing this out right now while sitting on another flight, a US Airways one. MUCH more comfortable and more than enough leg room. But I digress. Delta flight. We were supposed to take off at 7pm to get to Orlando at 11pm local time. We loaded up and backed on out of the gate. And sat. We sat just there for a freaking hour without moving! After 45 minutes they announced that it was some indicator light that had come on but that they didn’t need to fix anything, they just had to wait for someone to sign off on paperwork. When we finally took off we ended up landing in Orlando an hour late at midnight local time. I wasn’t checked into my hotel until after 2am because I had to get my luggage, get my rental car, and run to a different hotel to pick up my tripod rental before getting to mine to check in. I couldn’t even just go to bed because I had to rearrange all my bags from travel packing configuration to hotel + tweetup organization. Put all the clothes in the suitcase & carryon, put computer & cords in one shoulder bag that had been packed empty in the suitcase, and put camera gear in my beloved Tom Bihn bag. I have never in my life traveled with so much camera & computer equipment. I ended up finally going to bed at 3am with two alarms set to make sure I got up at 6am. It’s here! The first day of the tweetup! I had enough adrenaline in me that it didn’t even matter that I’d only had 3 hours sleep. I loaded the SUV and headed over to Melissa’s hotel to pick her up. We were on our way! The drive out to Kennedy was nice. We had enough to chat about the whole time, and I might have possibly maybe seen the eyes & snout of an alligator in the water in the ditch. We did definitely see a cow in a swamp. Yup, one cow, all by itself, standing knee deep in water. We’d recently passed a field with a herd so our theory was that this one cow had gone on walkabout. Because the route to Kennedy was so well marked, in our excitement we didn’t read the email w/directions close enough. At one point we weren’t supposed to take the highway veering to the left to Kennedy, we were supposed to stay on the one we were already on. But we didn’t. We got to Kennedy and then spent over ½ hour trying to find the press registration area. Turns out that had we followed the directions we would have been approaching the base from the south side rather than the west. We figured it out eventually & got where we needed to be. We got our tweetup & access badges, our swag bags, a vehicle permit, and a map with directions to the press site. Woo hoo! We went just a little ways up the road and hit a secure gate. After showing our IDs (I’ve finally used my passport!) we got to go through and we were officially in NASA restricted space. And hey, look up there. 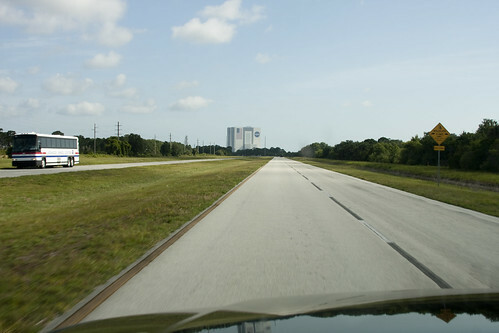 It’s the Vehicle Assembly Building right in front of us. That’s where we’re headed, turning just a couple roads in front of it. FIVE MINUTES LATER, we’re still approaching it, and have finally gotten close. The VAB is one freaking HUGE building. When it looks like you’re maybe ½ mile or a mile from it, you are really still 5 miles away. It’s just so unbelievably big that it throws your sense of perspective off. A quick turn where we’re supposed to go, another checkin at the gate to the press area, and we’re parking. We were so excited. There were the permanent press buildings on our right - CBS, Floriday Today, some unmarked ones. On our left - the freaking countdown clock! You know what I’m talking about. The one you always see on news coverage of the launch. And it was right there! There was water behind it. And across that water, pretty tiny to the naked eye, the launch platform. The only identifiable part of the shuttle was the very tip of the big orange external tank. But still, there she was, “our” shuttle, Atlantis. 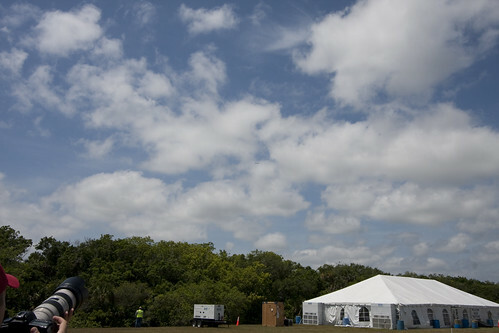 And past the press buildings ahead on the right, a big white tent. 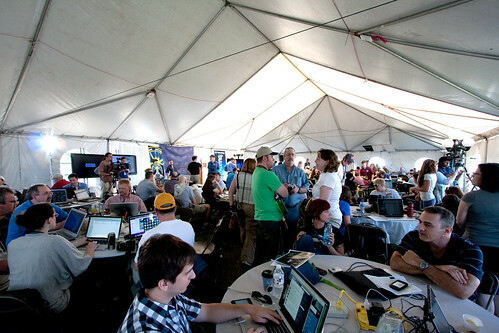 That was our home base, the NASA Tweetup Tent. Big enough to hold 150 people, air conditioned, big flat panels up front to air NASA tv, powerstrips for every table and wi-fi. They had hooked up a dedicated fiber for us to have wi-fi. It was so cool. They had everything a techno-addict needed. This is the first tweetup I’d ever been to. I’d never even been to any local ones. There’s a weird thing about tweetups. Everyone introduces themselves with two names. It’s either “Hi, I’m HellZiggy. My real name is Sharon.” or “Hi, I’m Sharon. My Twitter name is HellZiggy.” Thanks to the STS-132 Tweetup list that @NASATweetup had put together of all the confirmed attendees, there were already some familiar faces and familiar names. Melissa and I met our fellow Minnesotans, and we also found Twitter friend @MatthewJLB. Our tweetup badges all had both our Twitter name and our real name, so sometimes you’d just catch a name as someone walked past. Oddly enough, there were two other people at the tweetup that I was just 2 degrees of separation from. A guy named @Oblivion is friends w/one of my local geeks, Kami, and @AndyKilgore from Madison is friends with Sunspot’s drummer Wendy & knows the rest of the band. Out of 150 people from 30 states, the District of Columbia, Puerto Rico, the Netherlands, New Zealand and England, what are the freaking odds of that? Also, there was one person that wasn’t quite a friend of a friend. More like a nemesis. Twitter user @ErikHess was there, and his user name caught my eye because I know an Erik Hess on twitter, but his Twitter name is @fivesixzero. When I told “my” Erik he said to tell the one at the tweetup that he stole his name. So, while everyone was setting up their equipment, we were all also chatting and getting to know each other. For a large group who didn’t know each other for the most part, it was really easy to just start conversations with people and get to know them. Of course, we were all used to talking to strangers via Twitter. Oh hey, that saved me a lot of writing! We broke for lunch then, and I joined the herd that was heading toward the cafeteria. You know that crappy cafeteria food service you have at most companies? Yeah, NASA may have brilliant scientists, but they get the same average food as everyone else. It was AWESOME though since I hadn’t eaten ANYTHING that day, because I was too excited and too dumb to stop at a convenience store even. When got back from lunch it was pretty much time to get on the buses for our tour. And that was the first half of the first day.